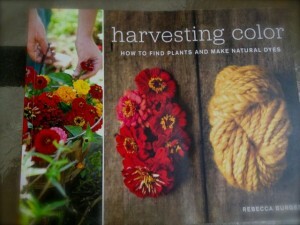 Perusing my natural dyeing book, Harvesting Color, one of the colors that attracted me was the red/magenta of pokeberries. 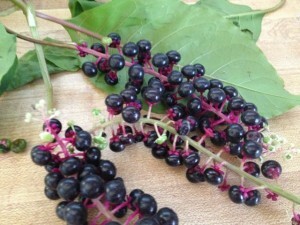 I can tell you the day I first saw a pokeberry plant–September 16th. It was the day before Anne and James left to return to New Zealand and part of our family day was a game of touch football played on the field next to our house. John, James and Anne were playing against Taylor, Johnny and Laura*. My job was to keep Kellen off the field. While doing so I spotted a pokeberry plant at the corner of my back yard and the baseball field. Hmmm. It took me three weeks to get around to harvesting the pokeberries. I’d learned that my friend had a whole patch of them behind her garage and I also noticed some growing behing my neighbor’s garage. But I was busy with other things and just didn’t get to it. I came home and checked the plant behind my neighbor’s garage and found a few clumps of berries. And a few more clumps (but not many) by the baseball field. Then I went in my own back yard and found a few more plants beneath the overgrowth of weeds that I’ve complained about for years–full of berries that the birds hadn’t found! I harvested about half of what I needed but enough to at least make a trial run. I needed a ratio of 25:1, weight of the berries to the yarn, which meant I could only dye about half an ounce of yarn with my 12.5 ounces of berries harvested. 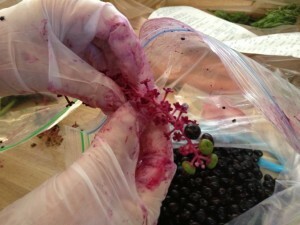 I followed the recipe, pulling the berries off their stems and crushing them inside a zip-loc bag. I added water and vinegar and let the vat steep for about an hour. 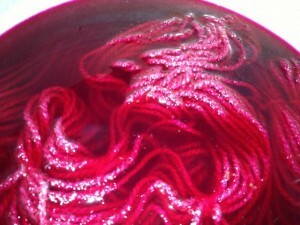 I also soaked the yarn in a vinegar mordant, as directed. I thought I removed most of the berries and seeds before adding the yarn, but discovered that I didn’t get all of them by a long shot. I had to hand pick lots of tiny seeds and more than a few berry skins out of the yarn both that night and the following morning. 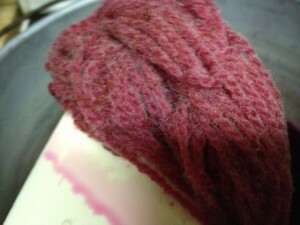 I let the yarn soak overnight, hoping to get a dark, rich color. It looked promising. I woke up early the next day, excited to see my dyed yarn. It still looked good when I removed it from the vat. 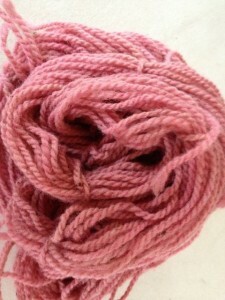 But faded even more when I rinsed it, a lovely heather shade. Still, it’s quite nice and satisfying. 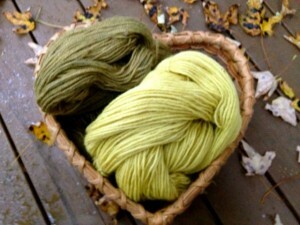 Later the same day, I went out looking for acorns to make a tannin solution for another part of the dyeing process. Simple huh? Find an oak tree and pick up lots of acorns on the ground. Well, I’d waited too long to harvest acorns as well. The squirrels beat me to the acorns, leaving only the shells. I had no idea I’d be competing with the birds and animals for my dyeing supplies. No slow poke-ing it next year when it comes to acorns or pokeberries! I’ve been thinking about dyeing fabrics for most of the summer. It all started with the problem of not being able to find just the right two-color combination for one of my tartan quilts. I did find a perfect white/blue fabric and wondered if I could simply dye the white to green and have the blue/green that I needed. I found a quality dye in olive green and tried it with less than ideal results. So, I went on Amazon.com and ordered a book about dyeing that purports to be “the only book about dyeing that you’ll ever need.” I couldn’t wait for it to come in the mail but when it did I was extremely put off/intimidated by all the talk of chemicals, protective wear, etc. I didn’t think I wanted anything to do with dyeing fabric after all. I wasn’t quite ready to give up so I went back to Amazon and searched “natural dyeing” and bought two more (used) books on natural dyeing. The first one that came was an old black and white book for a library, circa 1970. It was nearly as intimidating as the first book. I was ready to give up. When I received the second book in the mail and pulled it out of the envelope, I immediately knew I was going to like this one. I’ve been pouring over it ever since, anxious to try some of the natural recipes. Last weekend when I was in Northern Wisconsin I started looking around for some of the plants. 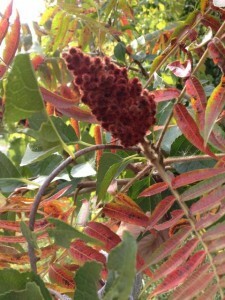 As John and I were riding home (instead of flying, as planned) he noticed some sumac at the side of the road. I kept seeing it after that and finally pulled off into a rest area to harvest some. I brought a grocery bag full of sumac home but never had the time to try it out. The next weekend, I came up to another cottage (John says I have an addiction to cottages) and threw in my dye pot and a few supplies just in case. I was/am planning to do some sewing for the cottage and thought all that time while I sewed I could also be boiling plants on the stove. The reason I hadn’t been able to do any of it at home is that each recipe seemed to require 1-2 hours of this and then another 1-2 hours of the next step. Mostly it is stuff that can simmer without much attention, but you still need to be around. Between work and sleep I never felt like I had that much time. I put the sumac on to simmer and followed the recipe until I finally finished a skein of lovely muted brown yard late last night. I was hooked! 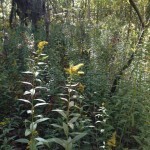 The next morning I went out to the Kal-Haven Trail with grocery bags and found goldenrod and what I think may be sheep sorrel. It was so lovely to walk among the fall colors and notice not only the leaves but all the undergrowth, the delicate flowers and colors. 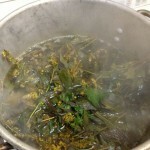 I came home and started the goldenrod recipe. I boiled and simmered it for 2 hours (plus some beach time) and prepared my yarn for the dye. By the way, I am using yarn that I bought last year when I was in New Zealand. I actually bought it for Johnny but he hasn’t touched it yet so I decided I might as well dye it. I thought it would be easy to find yarn to take home for a gift but none of the yarn stores I was in really had a lot of New Zealand wool to offer. (I probably just didn’t look in the right places.) On my last day with Anne, while she was packing for ABS, I drove over to Hobbiton to have a look around and on the way home saw a sign for yarn. I pulled in and went inside a little side store attached to a house. A quite old lady with some disability (a previous stroke?) waited on me. I can’t remember if she spun her own yarn and or dyed it, but I do know it was from her sheep and that she had knit many different things for sale. 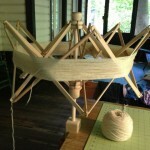 I ended up just buying a large skein of the yarn. Before I left she said I needed to go out a door at the back of the store and have a look. I opened the door onto the most idyllic scene, a grassy hillock leading down to a beautiful lake. It was incredibly beautiful. 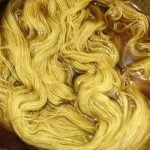 I’m really loving this process of natural dyeing. It probably helps that I’m doing it at a cottage in one of the parts of the country that I’ve always loved, Michigan’s west coast. And that the sun is shining, I’m out in nature, and feeling a little bit like an “earth woman.” I have to say it: I think I’ve dyed and gone to heaven!